This is the first book I’ve read from the author and the debut novel of a brilliant new talent in urban fantasy, Anna Hub. Ms. Hub has created an amazing premise for a story, something truly unique and the depth of her world building was quite distinctive and truly fascinating. Obviously a great deal of thought had gone into what could happen to her characters and how they would relate to the environment they were thrust into with no control over what happens to them. Selena Parker is experiencing haunting nightmares, and thinks what is happening is all a figment of her imagination until she is warned by a guy in a restaurant to be wary of her shadow. What follows is an engrossing, frightening and wild rollercoaster ride of a story as Selena discovers what she’s been warned about is true and her shadow has taken on a frightening new dimension in her life. She blacks out regularly and finds herself transported (painfully) to the ‘Shadowlands’ a scary, almost prehistoric world filled with danger. Each time Selene is transported, she faces wild creatures and gray-eyed hunters, who are determined to kill her. Selena discovers the man from the restaurant, Brayden, is also being transported to the Shadowlands, but because it has been happening to him for a longer period of time, he is spending much longer periods there. With no way of explaining what is happening to him, Brayden has been committed to a mental institution by his family and this is where Selena goes to seek answers. 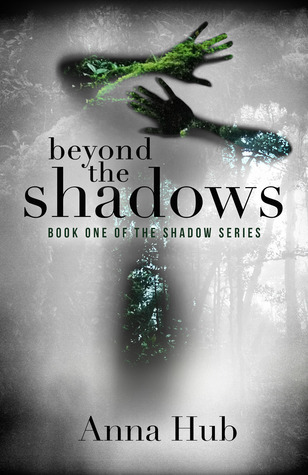 Selena is shocked and terrified to realize that her fate will lead down the same path as Brayden’s has, and eventually, she will be permanently trapped in the Shadowlands. Selena does everything in her power in the meantime to learn as much as possible in the ‘real’ world, to help herself and Brayden survive in the Shadowlands. Ms. Hub’s first book is a beautifully written and highly thought-provoking ‘what if’ scenario. I found myself engrossed in the story, enjoying the very thorough descriptions of the world Selena found herself in, and her emotional and psychological reactions to her troubles was both realistic and very natural. Ms. Hub has done an excellent job of giving us characters we can enjoy, cheer for and chew our nails over as they deal with the strange new world they’ve been thrown into. There are some quite frightening parts, and Ms. Hub has done a beautiful job of tension building and allowing the reader to become engrossed in the plot. There are some issues with dialogue and language which are not uncommon in a debut novel, but overall, this book is highly recommended. I should warn readers – this is a series of four books and the first book ends on a cliffhanger – but I was very happy to continue reading and have already commenced the second book in the series, as I’m invested in what happens to the central characters. Looks exciting can’t wait to read it!!! !